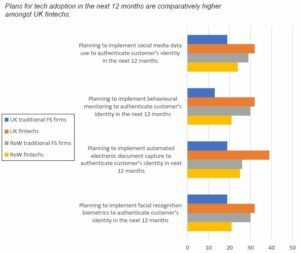 The findings show that 84 per cent of UK financial service firms – spanning incumbent institutions as well as fintechs and challengers – are concerned about their ability to identify customers. Traditional financial service firms in the UK are less focused on new technology solutions to address this and appear more inward looking, more focused on cost-control, and less inclined to invest in new technology than their global counterparts. Major regulatory changes this year including Open Banking and GDPR, as well as ongoing Brexit negotiations, are impacting the sector. At the same time customer expectations continue to rise as a result of digital empowerment and great experiences from the likes of Amazon, Apple and Facebook.However, UK fintechs are boosting the overall picture, with a much more positive approach to adopting new technology and investment in digital customer experience than the traditional financial service firms in the UK. 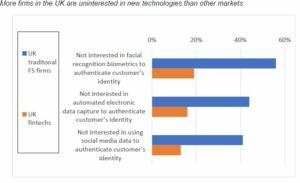 Interest in new technology such as facial recognition, automated data capture and social media data has yet to be widely adopted in the UK, meaning customers are currently missing out on seamless online transactions enjoyed in other markets. However, UK fintechs are much closer to the global competition than the UK’s traditional financial service firms, in terms of their interest in these new technologies and their plans to implement them in the next 12 months. When identifying and onboarding customers, UK fintechs are again much closer to keeping pace with global competitors, despite facing the same challenges as the established financial service institutions. In 2018 we’ll see unprecedented change in the financial service sector. At the same time, consumers are increasingly happy to use everyday digital services provided by organisations from across the world.